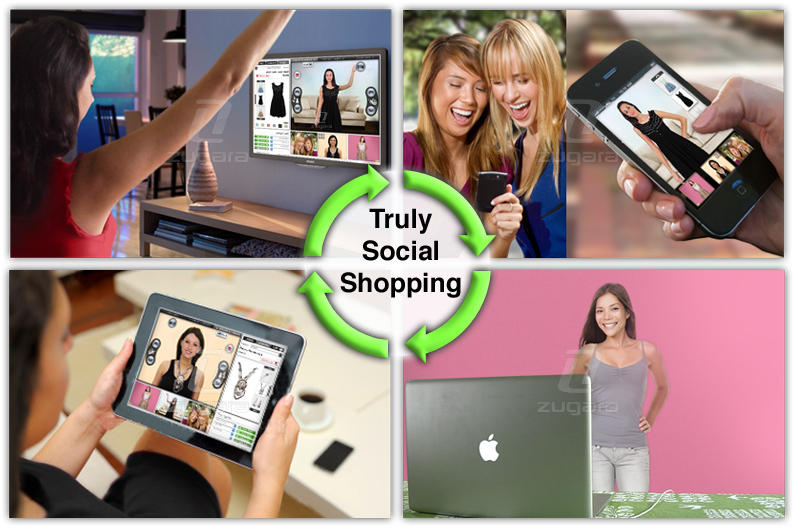 The U. S. Patent and Trademark Office has granted Zugara a patent on the company’s augmented reality social commerce platform, The Webcam Social Shopper (WSS). The patent, #8,275,590, relates to the simulation of trying on one or more virtual-wearable items within a video feed, using gestural controls to navigate through the interfaces, and taking pictures to share with your friends, all from within the WSS interface, says Zugara CEO Matt Szymczyk. So what does this “virtual dressing room” of the future look like? Imagine several friends video chatting. Ashley’s in front of her connected TV; Kara’s curled up on her couch, tablet in her hands; and, Christina’s out walking her dog, clutching her smartphone — all shopping together. They’re browsing, trying on dresses, necklaces, glasses and hats, giving each other feedback, and recommending items to one another. The camera (and microphone) will allow for a natural interface controlled by gestures, motions and one’s voice, as in Samsung Smart TVs and Microsoft Kinect, says Szymczyk.